A trio of analysts suggest the time and price are just right for continued upside in Micron Technology, Inc. (NASDAQ:MU). But for investors respectful of risk and less so of fanciful near-term Wall Street narratives; suiting up with a bullish modified fence strategy on Micron stock makes good sense without the sacrifice. It has been less than three weeks since I last presented the bull case for Micron stock, both off and on the price chart. And what a turn of events it has been for MU bulls. MU stock has gone from badly lagging the broader market to bursting higher by 33% to fresh highs last witnessed during the Dot.bomb fallout. And all the while, the strong rally has transpired, despite earnings not being released until March 22. 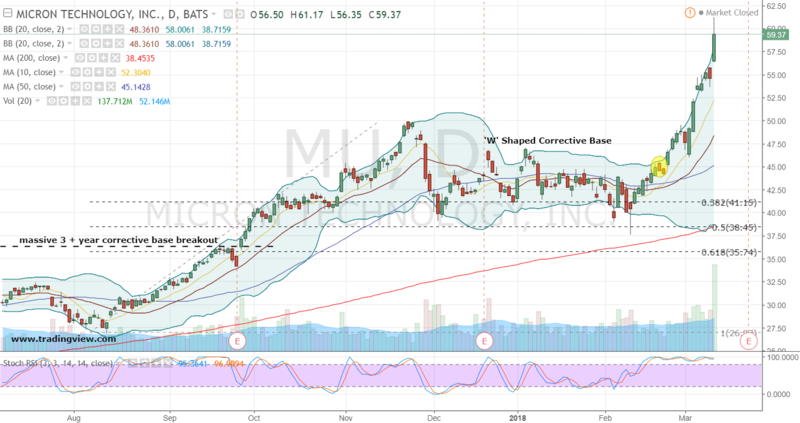 At the same time, investment firm Mizuho simply states Street estimates are too low with MU enjoying DRAM / NAND demand and price momentum into the June quarter driven by “server and GPU demand.” With all the table pounding for MU stock, it’s probably less of a surprise investors reacted by sending it up 8.76% to $59.37. Truthfully, today’s storyline sounds compelling longer-term, but it’s also far from new. Both management and a lopsided analyst community have been more or less making the same pitch for quite some time, while those firing bearish shots over the bow and calling for an end to Micron stock’s impressive business cycle have previously garnered the most of the attention. The bottom line? I’m still a bull on Micron stock. But I’m also a bit more concerned with what’s now happening both off and on the price chart in the near-term. Don’t get me wrong, I’m not calling a top in MU stock. I’m simply more interested in riding a friendly but sometimes still volatile price trend with a bit more risk control and without sacrifice. As mentioned, since I last looked at Micron shares, they have exploded higher. But with the next corporate confessional still ten days away, the anticipatory enthusiasm does appear to be getting ahead of itself without increasing the very real risk of a sell-the-news reaction. The question is, what’s a bullish investor to do without relying too heavily on hoping a pullback that meets one’s standards for entry occurs? Or likewise, simply appreciating that MU could trump near-term price constraints in favor of the big picture, which conceivably supports continued strength in Micron stock towards and beyond its turn-of-the-century high near $98? I believe the key to this dilemma are Micron stock’s options. A previously detailed April $48 / $55 bull call spread has surged in value from an entry price of $1.32 to $5.50 for a return of $4.18 or a gain in excess of 315%. There’s still $1.50 in intrinsic spread value waiting to be fulfilled if shares simply remain above $55, but I’d personally look to adjust. Given our view expressed above and after reviewing Micron’s options board, a fresh idea for positioning involves purchasing a bullish modified fence. Specifically and with shares at $59.37, buying the May $62.50 / $65 bull call spread and simultaneously selling the May $52.50 / $49 bull put vertical as a package for even money is attractive. The primary objective of this combination is for the call spread to go fully in-the-money with Micron stock rallying above the vertical. Should that occur, above $65 the trader pockets a profit of $2.50-per–spread. This position can also work well for investors’ intent to accumulate MU shares on a larger price decline. Bottom-line, the modified fence minimizes and limits risk relative to shares. On an expiration basis, the spread avoids a loss all the way down to $52.50, which allows for a healthy decline of around 11.50% before a buy decision comes into play at much more opportunistic levels in Micron stock. Disclosure: Investment accounts under Christopher Tyler’s management currently own positions in Micron (MU) and its derivatives. The information offered is based upon Christopher Tyler’s observations and strictly intended for educational purposes only; the use of which is the responsibility of the individual. . For additional market insights and related musings, follow Chris on Twitter @Options_CAT and StockTwits. 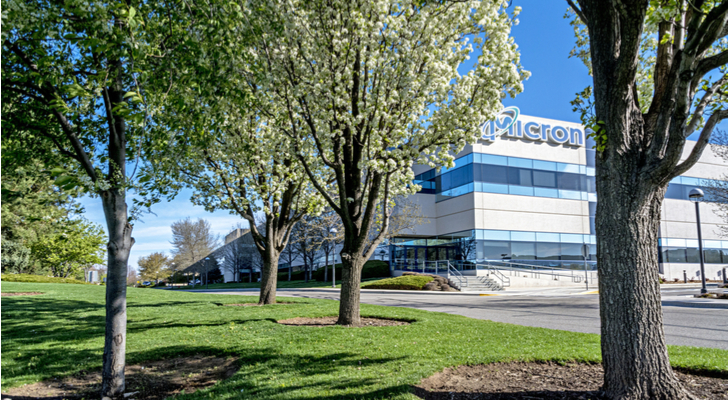 Article printed from InvestorPlace Media, https://investorplace.com/2018/03/micron-technology-inc-stock-tasty/.